Clean & Brite is the best cleaner of decks, fences, siding, logs, and masonry surfaces on the market that contains no harmful bleach. This environmentally safe outdoor cleaner is very effective and thorough. New Wood – Whether it’s a new log home, deck, fence or any outdoor new wood project, it is always recommended to clean the wood properly before staining and sealing. Clean & Brite removes surface dirt and dust from the construction process and kills and rinses off any hidden mildew spores that may have contaminated the wood. Clean & Brite will also brighten the wood if it has faded or lightly grayed prior to treating. Existing wood – Clean & Brite is an excellent maintenance cleaner for log homes, wood siding, wood decks and fences, and all other outdoor surfaces including painted outdoor surfaces. Clean& Brite is the best environmentally safe method of preventing mold and mildew by removing accumulated dirt and dust that acts as a food source for fungus. Prevent the formation of slippery fungus and mildew that will darken and speckle your wood decks, composite decks, wood siding and log homes by keeping them clean. Clean & Brite will actually extend the longevity of stains and sealers. Masonry, concrete, painted surfaces, and other outdoor surfaces – Clean concrete patios, driveways, aggregate, painted siding, fences, and other outdoor surfaces that need a mild cleaning solution. Tech Info – Clean & Brite is a one-step cleaner. This concentrated gel is a solution of phosphoric acid and mild detergents and additives designed for outdoor use only because it requires liberal rinsing with water. Dilute the concentrate with 3-5 parts water depending on the strength needed for your own specific project. Wet the surface liberally with the solution and let activate 30-40 minutes, then lightly scrub or pressure wash off making sure it is well rinsed with water. It does not remove previously applied paints, stains or sealers unless they are already loose, flaking or coming off. For significantly discolored or weathered wood, or wood requiring the removal of failed oil based finishes, our stronger two step Strip & Brite formula is recommended. 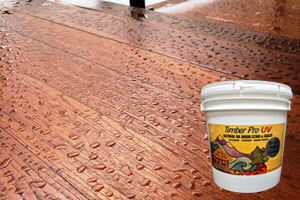 The best wood deck sealer on the market!